Product information "BlueStar Eyecushion Round Large"
The most Bluestar Eyecushions are currently available in 3 types of facing materials, all carefully chosen for performance, safety and comfort.Since 1984, every single genuine Bluestar Eyecushion is carefully crafted and inspected one at a time to ensure a perfect, sanitary, safe and consistent Eyecushion, right here in our Toronto production studio. Our production and inspection staff are taught and updated on an ongoing basis to ensure consistency of our high standards. In a world where quality is commonly compromised for profit, we are proud to maintain our high standards and deliver to you a high quality Canadian made product. And interestingly, Bluestar Eyecushions have been tested by Nasa engineers for space use and could be the first Eyecushions sent to Mars. 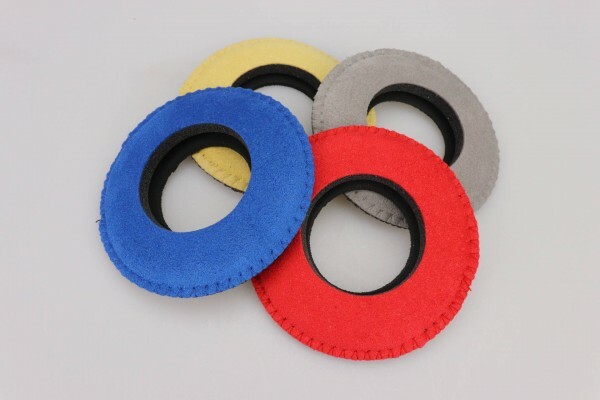 As the worldwide leader in the Camera Viewfinder Eyecushion market since 1984, Bluestar has become synonymous with Eyecup comfort around the world. Related links to "BlueStar Eyecushion Round Large"
Customer evaluation for "BlueStar Eyecushion Round Large"